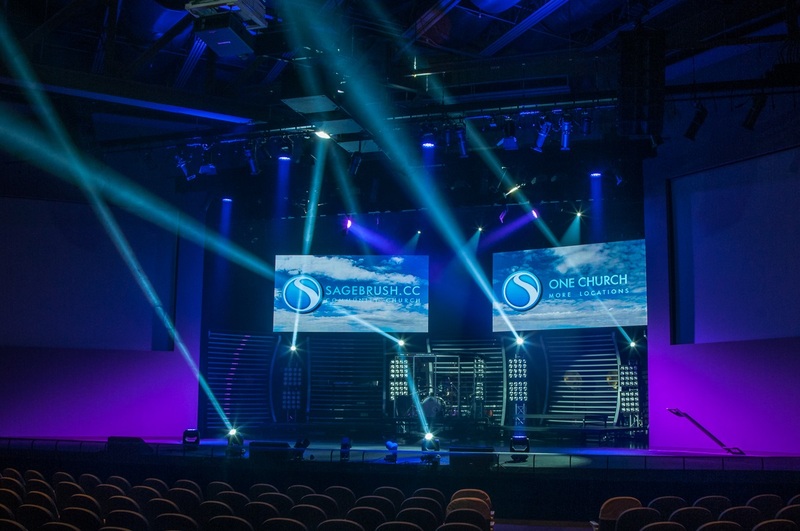 When Sagebrush Community Church of Albuquerque, New Mexico, built their new worship center, they decided to take visual presentation of their message to a new level with installation of a high resolution LED video screen by Elation Professional. 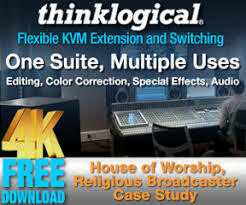 “Sagebrush had been using a large amount of video elements in the previous worship center but when they started the second phase project in building a new worship center, they wanted to improve upon that and chose the Elation EPV762 video panels,” stated Stephen MacAurther, Lighting Systems Designer and Engineer at VAST Technologies Inc., the Albuquerque-based systems design and installation company that completed the install. The installation includes 100 LED video panels from Elation’s Pro Video Series, 7.62mm pixel pitch EPV762 panels that are currently flown upstage and configured as two 50 panel sections (each 5’ high x 10’ wide). The Elation LED panels have given the church the ability to expand creativity in the way they use video by using the video panels alone, using video as lighting, or using lighting and video combined. The panels allow the creative team to enhance church services and are incorporated in a special program called Living Free. They are also used for other special events. 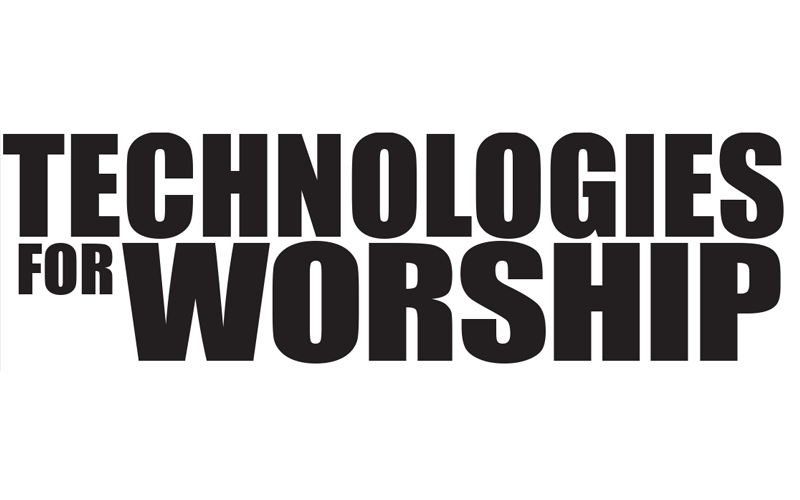 Video of the church services is captured, edited and rebroadcast at other Sagebrush campuses around the Southwest and podcasts are posted online for download. The EPV762 video panels work with an Elation Platinum Series moving head rig made up of Platinum Spot 15R Pro, Platinum Spot 5R Pro, Platinum Beam 5R and Platinum Wash ZFX Pro fixtures, along with Elation TVL 3000 II warm white fixtures. The Platinum moving heads are flown in the FOH cat-walks, on upstage and downstage pipe-grids, as well as on stage and on multiple ground-supported towers and props. “The Platinum series moving heads were chosen for their price vs performance ratio, high output vs low energy consumption and their compact size,” Stephen comments, adding that the Platinum ZFX LED moving heads give them greater flexibility in creating different lighting scenes. “They are very versatile and easy to use and I really enjoy working with them.” Stephen adds that the fixture’s built-in wireless DMX transmitter and receiver are utilized for ground-supported lighting to allow for more flexibility and speed in set changes. Meanwhile, the TVL-3000’s are used as foot lights for the main pastor for both services and video capture. VAST Technologies has partnered with Elation for the last 20 years and a combination of innovative products and customer support has been keys to the successful relationship. “Elation has been a ‘go to’ company for me because of the constant innovation,” Stephen states, who says he has always felt that Elation was able to provide products across a gamut of ranges that allow him to put together established sets and then improve those sets. 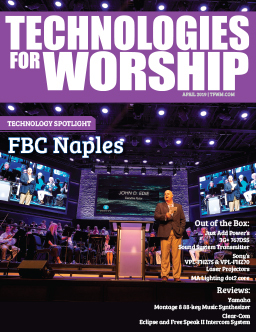 “Having local support on a new product design at the facility was a must for both Vast Technologies and the church. It was important that they are located here in the US and are available rather than reaching out across a different time zone every time we have a question. The support has been spectacular since day one. The quick turnaround time on servicing and the support staff has aided us and our customers in keeping large format systems consistently operating over time,” Stephen concludes.